Before Style4men.ca I had never tried “styling creams”. Since the launch of this project I have now tried a number. Typically, creams have offered very little grip or hold. They are essentially a finishing product to add some shine to your hair but they offer little more aside from that. When going through the Stickmore Hair product range and coming across the styling cream, I pretty much told myself: yeah, that’s not gonna be a match for my rebellious mope. But in the true spirit of product testing I tried it. This is turning out to be the product I never saw coming. Upon opening the jar I was presented with a white paste-cream like texture. It was a tad firmer than a typical cream when scooping it out. The product is extremely light and easy to spread in the palms and then blend in the hair. Up to this point, everything indicates a “cream”. A few seconds after contact is made with the hair is when things take a different turn. The product started to seize a little – very much like a clay does. Usually creams have a high oil content and essentially stay active for the duration of their stay in your hair. 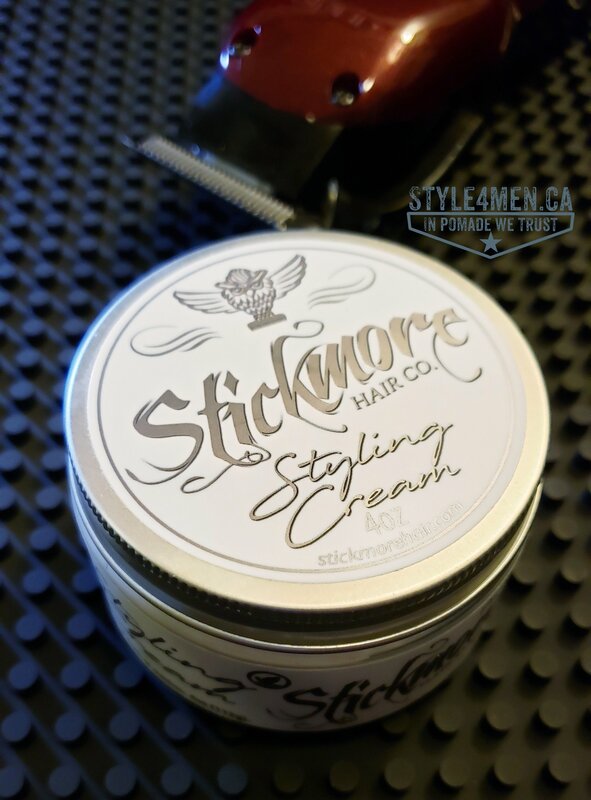 The Slickmore Styling cream bonded with the hair giving it a very natural look with completely unexpected control. The one thing that makes clay’s a harder product to work with is how fast it seizes in place; under a minute. This cream granted a bit more time and didn’t seize nearly as much as most clays. I was able to comb and style my hair. Now here is where the real surprise came. Since this identifies itself as a cream I was putting it in the “cream” bucket along with the expectations of a cream, which adds shine and little hold. This puppy offered some shine but nothing beyond a normal healthy hair shine, but on the control front it was a whole different story. This stuff holds. Normally a cream would give me maybe 30 minutes of hold before needing repeated attention to maintain some sort of style. This was more of a “style and lock”! Read that as “all day commitment”. An “all-day-commitment” can often equate to firm and nearly crunchy hair, not with Stickmore. The hair remained pleasant to the touch. Your fingers will identify a slightly waxy-tacky substance but that fades over the course of the day as the product is absorbed. I will say it again, this is the most unexpected cream I have had the pleasure of working with. This is now the 3rd day in row that I wear this product and my hair is looking mighty fine. If you are a regular at Style4men.ca you have read my rants on excessive shampooing and those “deep-cleaning” shampoos that strip everything out of your hair. You will also know that I favor re-styling at least 1 extra day before saying good bye to that pomade. But in order to do that, you need a little outside help from H20. I use a barber water spray bottle to add some moisture to my mope before applying a little more product and then style. This approach has worked very well with the Styling Cream. In closing, this is not at all the product I was expecting it to be. Which goes to say that judging a book by its cover can be misleading. The hold of this cream is serious and comparable to firm hold pomades but with the benefits of pastes-creams. I am usually, or at the very least, have become a pomade-centric guy. This product is making see that there can be more (Stick-more).